James Monahan and Cristina Capra, both 7th graders at the Collins Middle School, hold baskets of paper cranes that the 7th graders made. 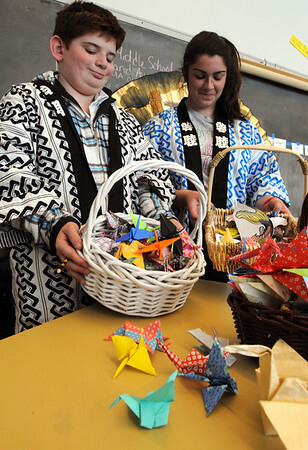 For weeks, the school has been raising funds for tsunami relief in Japan. Photo by Ken Yuszkus/Salem News, Friday, May 6, 2011.